Becoming obese makes for an ugly sight; you need to slim down as obesity may be the source of a lot of diseases. You can be slim without curbing your usual food habits; this is possible with VitoSlim™ an herbal formula, which does not alter your regular diet but burns fat very fast. You can lose weight naturally with no side effects. If you are overweight and want to shed those extra kilos without having to overwork in the gym, then you are at the right place. Losing weight will help you to stay fit and active and your level of confidence will also increase. Over-weight and obesity are amongst the most common health issues in the urban world today. With the advent of the more industrious and a fast lifestyle, people are getting more glued to junk foods and a hectic lifestyle - thus leading themselves to the detrimental consequences following obesity. Obesity makes you prone to various ailments. When one is overweight or obese, one might be vulnerable to health problems like heart attacks, strokes, liver problems, gall bladder problems, diabetes and other health hazards. Composed from a rich supply of herbs and an exclusive combination of important nutrients, VitoSlim™ tablets are an all-natural supplement that gives your body a slim outlook. The key nutrients present in the tablets are designed to work effectively on the natural metabolism of the body. 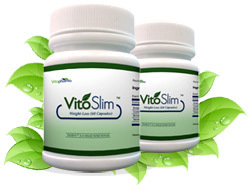 VitoSlim™ is a fine mixture of essential herbs that helps in burning fat. Unlike the other slimming pills, it acts fast on the body and give you superb results without any side-effects. VitoSlim™ helps you to lose weight faster compared to synthetic fat burners because they work better in combination with food and exercise. Medically tested and approved, VitoSlim™ is an effective herbal remedy for weight loss which is a blend of the finest herbs, and being herbal, it is 100% free from any side effects. VitoSlim™ is the natural alternative to synthetic fat burners in market. They are Ephedra free and tackle all key issues of weight loss with efficiency and accuracy. It works only on enzymes that break down fats and works in our digestive systems and not on our brain or heart. Take 1 capsule three times a day on a daily basis with a glass of water. Follow the course to regularly to achieve effective results in weight-loss. VitoSlim™ is made of pure and natural herbs; it assures complete safety and is absolutely free of side effects and recommended by the most experienced and renowned doctors. Our happy customers are gaining their desired results and reordering the products which confirm the safety and effectiveness of the product.